Arnold real estate is mostly made up of established and older homes. The homes for sale in Arnold MO offer floor plans with 2 bedroom, 3 bedroom or 4 bedroom options. Arnold MO homes for sale range in price from $75,000 to $550,000. The median home price in 2014 was approximately $160,000. Within the city of Arnold, you will find award-winning schools, various churches, and plenty of recreational activities. The Arnold Recreational Center is a gathering center for people of all ages, complete with its own two court gym, indoor leisure pool, fitness center, party room, track, locker rooms, three meeting rooms, outdoor leisure pool, outdoor concession stand, and a lounge complete with a large seating area, air hockey, pool table, and foosball. This town even has its own festival called Arnold Days, talk about community pride! Arnold is a city built for neighborhood barbecues, where adults and children can feel safe to gather around and meet new friends. If you instead would prefer to enjoy the great outdoors, Arnold is still your town. Arnold is rich in parks, rivers, and plenty of outdoor activities such as the Arnold Farmer’s Market and Pomme Creek Golf Course. They even have not one but two dog parks with separate areas for both large dogs and small dogs. The Fox C-6 School District serves Arnold MO real estate. The district provides a pre-k school, eleven elementary schools, 4 middle schools and 2 high schools including Fox High School and Seckman High School. If you’re interested in learning more about Arnold MO homes for sale, please contact St Louis County real estate expert, Sharon Colona and St. Louis Realty for a professional and simple buying or selling process.Call (636) 397-7653 or email at scolona@stlouisrealty.net. (PUBLIC OPEN HOUSE, SUNDAY APRIL 28, 1PM-3PM) Beautiful and welcoming 2-story, 4-BR, 4-Bath home in the prestigious Wicks Station subdivision with large lots. 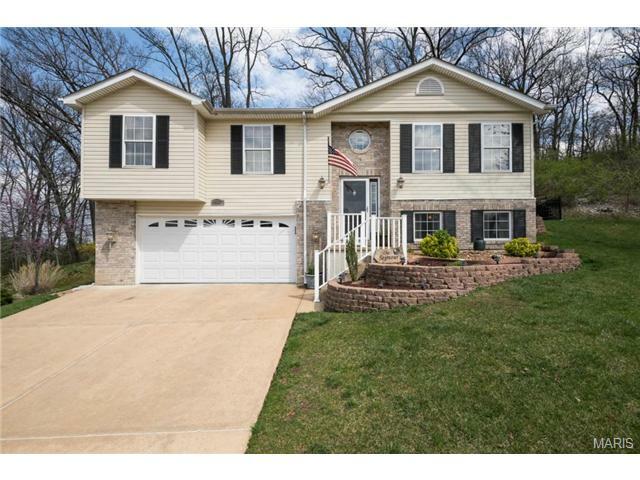 Nestled into a partially wooded 3.17 acre plat, over 100 yards from closest neighbor via dense woods. LOTS of trees with large open area in front. House well off road for privacy. 240 x2019; easement behind property assures no homes will be built behind. Recently updated kitchen, woodburning fireplace with insert, Hurd double pane wood windows & new carpeting. Extra-large master suite with walk in closet, separate shower/tub. Basement w/rec room, large, built-in wood wet bar, family TV room, room for a pool table, full bathroom and sleeping room/office, storage room w/shelving & work bench. Swimming pool, inside parking for 4 cars, with oversized shop and storage area. Large, level parking for RV x2019;s, boats, etc. and 39 x2019;x60 x2019; apron parking area. New roof 2014. Small section of lot far away from house in the 100-year flood plain. Gorgeous Custom blt home on 1.17 ac w/lots of privacy in north Jefferson County. So you benefit w/much lower taxes in JeffCo but you can be in StL County in 3 mins truly a win-win location in every way. Close to all major area hwys for a quick & easy commute. Out the rear of the house you only see woods & only woods out the front. Covered front porch, a new Fiber Horizon deck w/beauty & durability over looking a pond less waterfall, a 3 car over sized side entry garage, and impeccable landscaping. You enter to an open foyer w/hardwood flooring leading into the great rm w/a cathedral ceiling, 2 sided see thru fireplace visible to the kitchen/breakfast rm combo w/a center island cook top, built in oven, new counter tops, custom cabs, mfl, formal dining rm, 2 nice sized bdrms, full hall bath & a stunning master bdrm w/fireplace & full bath as beautiful as any you'll ever see. LL is finished w/an awesome full bath, lg family Rm walks out to an elevated deck & the 4th bdrm, IT's ALL HERE!! Truly stunning home w/open floor plan & 3800sqft of living area, featuring 2 full baths & 2bdrms on the main level. Home has been freshly painted & has new flooring on Main and Upper level. The home is customized with elegant high end fixtures, features and upgrades. Home sits in a cul-de-sac w/7 custom homes, minutes from 141 & 55. Entering the house, you x2019;ll find a grand two story entry foyer leading to the vaulted dining room followed by the soaring 2 story great room with beautiful atrium windows. Next, you will find the large breakfast and custom kitchen complete with upscale cabinetry & finest stainless appliances. The large Master is equipped with a large, spa-like cultured marble shower with 2 shower heads along with his and her sinks, & large bathtub. On the second story you will find 2 nice sized bedrooms, & loft area overlooking the entry foyer/great room. LL was professionally finished with a large bar and entertainment area. Plus home has dual heating/cooling. Beautiful Dalba built 1 1/2 Story! Why build when you can purchase this 5 year new home? Beautiful Brick/Vinyl exterior greets you as you drive up & upon entering, the 2 story foyer leads to the spectacular 2 story Great Rm offering a stunning floor-to-ceiling stone fireplace & open staircase w/metal spindles that leads you upstairs. Enjoy entertaining in your Dining Rm. Kitchen boasts beautiful 42inch wood cabinetry w/quartzite countertop,upper crown molding & pull-out drawers, brkft bar, gas stove, pantry & adjoins the Breakfast Rm w/bay slider leading to the patio. Main Flr Master Bedrm offers a w-in closet & luxury Bathrm w/2 taller ht. vanities, lg tub & separate shower. Gorgeous hardwood flrs thruout most of main level. Great convenient main flr laundry. Ascend the stairs to the balcony area & 2 spacious Bedrms & Full Bath. Unfinished lwr lvl offers great potential w/its full bath r-in & egress window. Addl features:Geo-thermal heating/cooling, metal fenced backyard...Plus More! A must see 1 1/2 story in Arnold. Walk in to a beautiful vaulted entryway with plenty of natural light. Large vaulted family room with gas fireplace and a floor to ceiling wall of windows..... perfect to watch the snowfall. Main floor office with French doors. Large Master bath with separate tub and shower. Walkout basement waiting for a new owner to finish and personalize. Two bedrooms on second floor with an additional living area/loft. Fantastic Opportunity to own a stunning display home loaded with todays most desirable finishes! This impressive display by Payne Family Homes in the beautiful Henley Woods neighborhood is MOVE IN READY! This community is located near Lone Dell Elem School & has 144 home-sites in a panoramic setting w/abundant common ground, 2 nature trails & mature trees. This 2 story home has 4 BD, 2.5 BA, 2,480 s/f, a Loft, main flr Flex Rm & 2nd flr Laundry Rm. Features inc 9 x2019; clngs, 42 x201D; white cab w/crown & hardware, Quartz c-tops, st steel appl, exp island w/seating, laminate flrs, wr iron railing, dbl bowl raised height vanities in the Mstr Bath, marble shower w/seat & W/I closet in the Mstr, humidifier, R/I bath, sec system, Low E windows, R 38 ceiling insul, W/O bsmt, deck & more. The ext is inviting w/full sod, irrig system & prof landscape. There is easy access to Hwys I-55, 21 & 141. Conveniently located near Mastadon State Park, local parks, the Arnold Rec Center, shopping & restaurants. Welcome home to Henley Woods, a Payne Family Homes neighborhood offering NEW CONSTRUCTION in Arnold. This community is located near Lone Dell Elem School & offers 144 home-sites in a panoramic setting w/abundant common ground, 2 nature trails & stunning mature trees. Payne Family Homes is offering their popular Vision Series of homes which inc ranch, 1.5 story & 2 story plans. The Hamilton 1.5 is a 4 BD, 3 BA, 1.5 story with 2,344 s/f of living space. Features inc an open Kit-Grt Rm-Caf xE9;, main floor laundry, large walk in closet in MAIN FLOOR MASTER, Frigidaire appl, a Loft-bdr-bath upstairs, Jeld-wen Low E windows, full yard sod, prof landscaping, arch shingles w/a Lim Lifetime Warranty, 10 yr structural warranty & more. You can enter this neighborhood off Lonedell & Pomme Rd. Residents will have an easy commute with quick access to Hwys I-55, 21 & 141 and is located near Mastadon State Park, local parks, the Arnold Rec Ctr, shopping, restaurants & entertainment. MOVE IN READY, New Construction by Payne family Homes in Henley Woods. This top selling ranch has 3 BD, 2 BA & 1758 s/f of living space. Features inc a 3 CAR GARAGE, vaulted ceilings, 42 x201D; cabinets, granite c-tops, large Kitchen island w/brkfst bar, Frigidaire st steel appl, laminate floors in the main living areas, shower w/seat in the Master Bath, double bowl raised height vanities in the Master, main flr laundry, wave bowls in the bathrooms, R/I bath, Jeld Wen Low E windows & R 38 ceiling insulation. The ext is inviting w/brick, vinyl siding, arch shingles, full sod & prof landscape. This beautiful community is located near Lone Dell Elementary & offers 144 home-sites in a panoramic setting w/abundant common ground, 2 nature trails & stunning mature trees. There are convenient entries off Lonedell & Pomme Rd. Residents will have quick access to Hwys I-55, 21 & 141. Henley Woods is located near Mastadon State Park, the Arnold Rec Center, shopping, restaurants & entertainment. ENJOY THE BENEFITS OF BRAND NEW with NEW CONSTRUCTION by Payne Family Homes in Henley Woods. This community is located near Lone Dell Elem School & offers 144 home-sites in a panoramic setting w/abundant common ground, 2 nature trails & stunning mature trees. This smart 2-story home has 4 BD, 2.5 BA, 2,031 s/f, an open flr plan & a convenient upstairs Laundry Rm. Features inc 9 x2019; ceilings, 42 x201D; cab, st steel appl, Kit island, Quartz c-tops, wood laminate flooring, side staircase design, dbl bowl raised height vanities in the Mstr Bath, shower w/a seat, dual closets in the Mstr Suite, humidifier, R/I bath, Jeld Wen Low E windows & R 38 ceiling insulation. The ext is inviting w/vinyl siding, vert accent siding, arch shingles, coach lights, full sod & prof landscape. There are entries off Lonedell & Pomme Rd. Residents will have an easy commute w/quick access to Hwys I-55, 21 & 141 as well as Mastadon State Park, local parks, the Arnold Rec Center, shopping, restaurants & entertainment. Enjoy the benefits of a BRAND NEW HOME with NEW CONSTRUCTION by Payne Family Homes in Henley Woods. This beautiful community is located near Lone Dell Elem School & offers abundant common ground, 2 nature trails & stunning mature trees. This open ranch plan has 3 BD, 2 BA & 1,758 s/f of open, smart living space. Features inc a 3 CAR GARAGE, 9 x2019; clngs, 42 x201D; cabinets, quartz c-tops, large Kit island w/brkfst bar, st steel appl, wood laminate flrs, open stairs to the lower level, shower w/seat in the Mstr Bath, dbl bowl raised height vanities in the Mstr Bath, main flr laundry, humidifier, R/I bath, Jeld Wen Low E windows, R 38 ceiling insul & more. The ext is inviting w/vinyl siding, vertical accent siding, arch shingles, full sod & prof landscape. This community offers convenient entries off Lonedell & Pomme Rd. There is easy access to Hwys I-55, 21 & 141. Henley Woods is located near Mastadon State Park, local parks, the Arnold Rec Center, shopping, restaurants & entertainment. Welcome home to Henley Woods, a Payne Family Homes neighborhood offering NEW CONSTRUCTION in Arnold. This community is located near Lone Dell Elementary & offers 144 home-sites in a panoramic setting w/abundant common ground, 2 nature trails & stunning mature trees. Payne Family Homes is offering their popular Vision Series of homes which inc impressive ranch, 1.5 story & 2 story plans. The Edison is a 4 BD, 2.5 BA, 1.5 story w/2,368 sq ft of living space. Features inc an open Kit-Caf xE9;-Great Rm, main flr laundry, W/I closet in the Owners Suite, a MAIN FLOOR MASTER, a Loft, spacious secondary bdrms (2 have W/I closets), Jeld-wen Low E windows, Frigidaire appl, full yard sod, prof landscape, arch shingles & an extensive list of inc warranties. This community has convenient entries off Lonedell & Pomme Rd. Residents will have an easy commute w/quick access to Hwys I-55, 21 & 141. Henley Woods is located near Mastadon State Park, the Arnold Rec Center, parks, shopping & restaurants. Welcome home to Henley Woods, a Payne Family Homes neighborhood offering NEW CONSTRUCTION in Arnold. This community is located near Lone Dell Elementary School and offers 144 home-sites in a panoramic setting with abundant common ground, two nature trails & stunning mature trees. Payne Family Homes is offering their popular Vision Series of homes which inc ranch, 1.5 story & 2 story plans. The Franklin is a 4 BD (plus a loft), 2.5 BA, 2 story w/2,480 sq ft of living space. Features inc a Flex/Den/LR on the main floor, Frml DR, convenient 2nd floor laundry, W/I closet in Mstr Bdr, white 6 pnl doors, Frigidaire appliances, Jeld-wen Low E windows, full yard sod, prof landscaping, architectural shingles, 10 year structural warranty & more. You can enter this neighborhood off Lonedell & Pomme Rd. Residents will have an easy commute with quick access to Hwys I-55, 21 & 141 and is located near Mastadon State Park, local parks, the Arnold Rec Center, shopping, restaurants & entertainment.